The Islamic State of Iraq and the Levant (ISIS) made dramatic advances across northern Iraq on June 10. Building upon its success in Mosul in Ninewa, ISIS pushed southward into Salahaddin and Kirkuk provinces. The government appeared completely ineffectual as the crisis unfolded. More importantly, the Iraqi Security Forces (ISF) collapsed in several cities hardly putting up a fight. This has left the Islamic State in control of a large swath of northern Iraq exponentially speeding up their plans to march towards Baghdad. 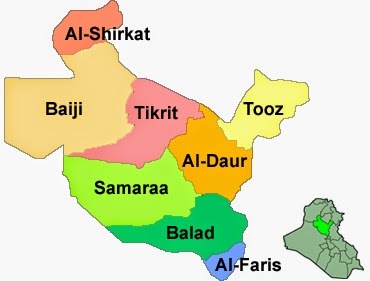 June 10 ISIS moved down from Mosul through Shirqat and part of Baiji to threaten Tikrit (Wikipedia) ISIS also able to seize control of western Kirkuk’s Zab, Hawija, Abassi, Riyad, and Rashad (United States Institute of Peace) June 10, 2014 started with the Islamic State of Iraq and the Levant’s (ISIS) surprising victory in Mosul, the second largest city in Iraq. According to two stories, the Federal Police in the city were ordered to withdraw from their posts with no information about where they were to regroup or what to do with their equipment. The ground forces commander General Ali Ghidan, joint operations commander General Abbud Qanbar, and Ninewa Operations commander Gen. Mahdi Sabah Azzawi al-Gharawi all fled the city as well. Those two events led to the general collapse of the security forces many of which left behind all their equipment, shed their uniforms and joined the exodus of citizens to Baghdad and Kurdistan. The taking of Mosul provided ISIS with a huge amount of resources. First it took over several banks, which were said to hold up to $420 million. That will be used to finance the on going offensive. It freed several hundred prisoners from Badush prison outside of Mosul and other jails. Many of these detainees were ISIS fighters and they will likely rejoin the fight. Speaker Osama Nujafi who hails from Mosul also said that the insurgents were able to seize some army helicopters at a military air base. This was a shocking turn of events. Early reports seemed to have reinforcements and the army air force heading towards Mosul just after the government had been able to re-take Samarra in Salahaddin the day before. ISIS was pushed back to just the eastern side of the city. Then the order to withdraw and the departure of the three generals seemed to cause a panic and everything went south afterward. With that huge victory the Islamic State decided to push the matter and drove towards Baghdad. Iraqi police uniforms strewn across highway leading out of Mosul symbolizing the collapse and retreat of the security forces in the city (via Liz Sly) ISIS was able to seize several towns and cities in Salahaddin and Kirkuk provinces with hardly any effort as the ISF collapsed before it. ISIS seemed to split its forces and took Highways 1 and 80 south. The former leads into northern Salahaddin where ISIS was quickly able to conquerShirqat district. It then moved farther down the highway where it took Baiji, burning down the city’s police station, and seizing a large army depotwith arms and ammunition that had been abandoned without a fight. 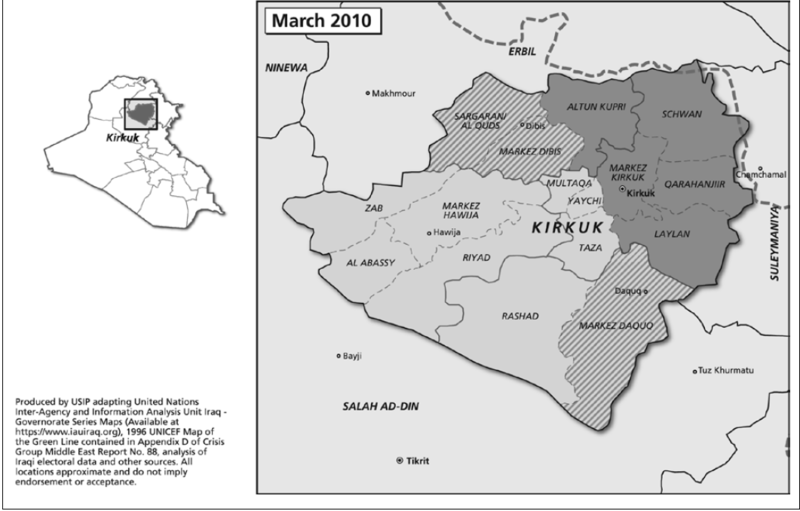 In neighboring Kirkuk it took most of the western section of the governorate. It conquered Zab, Hawija, Abbasi, Riyad, and Rashad. The head of the Hawija council said that the army and police had been ordered to withdraw form the area allowing ISIS to take another section of the country without firing a shot. The neighboring area of Sulaiman Bek in Salahaddin fell at around the same time again with the police fleeing as well. A Federal Police unit did resist along the Kirkuk-Baghdad Highway 3 but were forced back. By the end of the day there were reports that ISIS had seized checkpoints to the north and to the east of Tikrit, and was fighting over the air base north of the city. This was a dramatic advance across the northern section of the country. It left ISIS in control of parts of three provinces. It has also greatly increased its threat to the central government and put them at the cusp of threatening Baghdad. With its existing bases in Anbar, northern Babil, and eastern Diyala it has surrounded the capital probably faster then even it expected. The government was caught completely off guard by these developments. Prime Minister Nouri al-Maliki set up a special crisis unit to deal with the deteriorating security situation, and threatened punishment for any members of the ISF that abandoned their posts. He also proclaimed that the government would retake Mosul in 24 hours. There was word that the Defense Ministry was sending special forces to do just that. In Kirkuk a joint peshmerga and army aviation operation was supposed to have secured the border with Ninewa in Hawija, but that was seemingly pushed aside or never occurred as ISIS took the area. Finally Maliki called on parliament to declare a state of emergency, while the lawmakers said they would have a special session on Mosul on Thursday June 12. Since Maliki controls the Defense and Interior Ministries, the intelligence agencies, and is the commander and chief of the security forces it is not clear what additional powers he would gain from a state of emergency. It would also take the parliament agreeing on giving a premier many dislike greater strength. Finally, by the time the legislature convened on June 12 the security situation may be so bad that ISIS is at the gates of Baghdad. It seems like the government was completely disconnected from the situation on the ground, and could wait a few days to even discuss the matter. With that type of leadership it was no wonder that the Islamic State was able to sweep across Ninewa, Salahaddin and Kirkuk in just one day. ISIS probably never imagined they would have so much success in Iraq in such a short period of time. There was some precedent however as Fallujah fell within a day in December 2013, and most of Anbar quickly followed. The Islamic State can be expected to move towards Kirkuk, but more importantly continue its move down Highway 1, which would take it through Tikrit to Samarra to Taji and then Baghdad itself. It may even push in from its bases in Anbar to the west, Diyala in the east and Babil from the south. The question is whether the ISF will be able to rally itself and put up some kind of resistance. The Shiite militias, which are already deployed to Anbar, Baghdad and Diyala may be used as well since the closer the insurgency comes to the capital, the greater the existential threat will be to the government forcing it to turn more and more to irregular forces to bolster the army and police. There are still plenty of units Maliki can draw on from southern Iraq and there has been a call for volunteers in that region as well to help the security forces. This is very similar to the 2004 uprising by the insurgency. Then too the ISF collapsed. The difference today is that the militants are far more homogenous with the Islamic State by far the largest and most powerful and the driver of this current wave of violence. The United States is also not on the ground to save the government. That makes the outcome of this conflict all the more unpredictable. Even if the ISF were able to retake some of these cities it has consistently proven in Anbar and Babil that it cannot hold the territory afterward. That probably means at minimum ISIS has greatly expanded its operational borders. For the government, Maliki has to work quickly and decisively to regain territory something he did not show on June 10.